Guys and girls, Monash will be organising a post conference seminar for EAMSC Japan and AMSC Philippines on the 11th and 12th May in Monash University Sunway Campus! 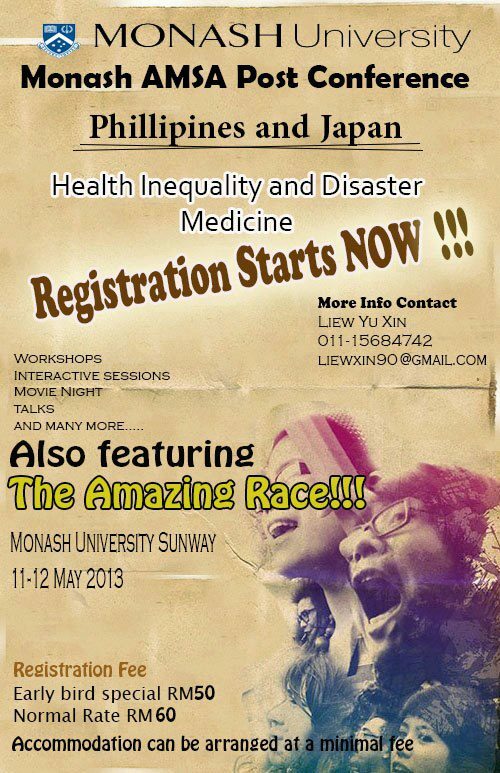 The theme of the post conference will be on health inequalities and disaster medicine. There will be lots of interesting, interactive and educational activities throughout the span of the two days including keynote lectures, workshops, movie night, and of course our highlight – the AMAZING RACE: medicine edition! Hope to see your support.